Involving a personal trainer in the creation of your specific and realistic fitness goals ensures that your trainer will develop the best workout routine in order for you to achieve them. If you want to get a good workout in order to maintain your weight, stay physically active, or lose weight and great shape, then discuss with a trainer what you are there for in order to devise the best and most realistic goals. A certified personal trainer is knowledgeable in fitness and nutrition. Additionally, they also have the most helpful tips and advice on how to realize fitness goals faster and better. It is always great to work with someone who can aid you in achieving what you think you can’t. Having someone who will constantly challenge and cheer you on is also part of the perks of working with a certified personal trainer. 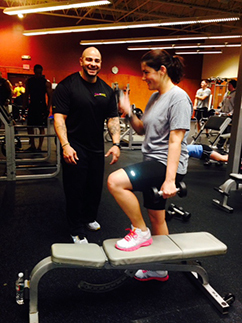 Once you begin your personal training program in Canton, MA it will become a routine and become easier to stick with. A trainer will hold you accountable because that would mean failing yourself. Treat your personal training program like an appointment or meeting, that way you will perform it regularly. If you value your health and want to lead a more balanced, active and happy life, then start working on it now and add to it a balanced diet. To find out more about the other perks of working out with a personal trainer, contact Answer is Fitness.